inch overlap specimens of O.064-inch-thick FS1-H magnesium. be revised as additional data become available. 75S-T6 aluminum, on the initial bond strength of joints to this metal. improve boniIng to this metal. from each of the panels. periods of 20 or 40 minutes. Affected by Chemical and Anodizing Treatments of the Surfaces. Forest Products Laboratory Report No. 1842.
for i hour at 180 F. before drying. ing by two aircraft fabricators by using their established procedures. Operating temperature of the solution was 180 to 200 F.
(11) Air drying prime coat for at least 24 hours prior to bonding. minutes at 180 to 200 F.
Ld Flower St., Chester, Pa.
impany, 627 Greenwich St., New York 14, N. Y.
,ctoria St., Costa Mesa, Calif.
of the l fne to that of the press platen. to bring the temperature of the glue line to that of the press platen. square inch of pressure in a hot press at a temperature of 325 F.
the temperature of the glue line to that of the press platen. adhesion, cohesion, and primer and coating failures were recorded. 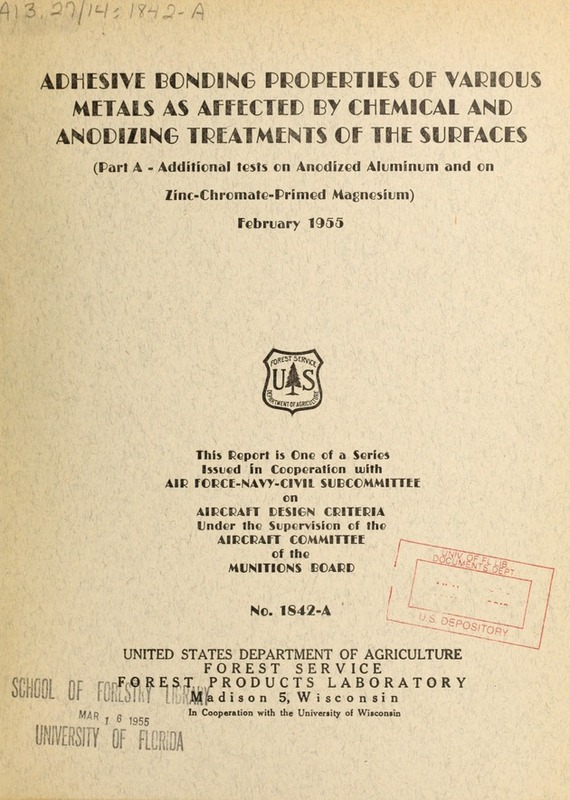 chromate-primed magnesium in table 2.
chromate-primed magnesium but this possible effect was not investigated. the magnesium treated by method A.
overlap of 0.064-inch-thick bare 75S-T6 aluminum alloy sheet. water. The Reynolds Metals Co. states on page 48 of its handbook, "Finishes for Aluminum,"
converts the oxide to the monohydrate that seals the pores of the film. : P.s.i. : Percent : Percent : Percent: P.s.i. indicating failures of the primer or coating of the metal. )i. * \ ** .